A new initiative designed to cut costs and improve cotton yields in India’s Maharashtra state, is helping some of the country’s most vulnerable farmers. 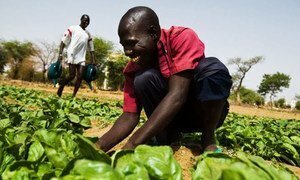 Although overall exports from countries and regions with plenty of agricultural land are forecast to increase, the OECD-FAO Agricultural Outlook 2018-2027 stressed that because agricultural trade plays an important role in food security, there needs to be an enabling trade policy environment. According to the Agricultural Outlook, undernourishment is concentrated in conflict-riddled and politically-unstable countries – with the Middle East and North Africa (MENA) facing simultaneous challenges of food insecurity, rising malnutrition and managing limited natural resources. The report forecasts strong growth in agriculture and fishing in developing regions whose populations are rising fast, including Sub-Saharan Africa, South and East Asia and MENA. These areas are facing the challenge of limited land and water resources as well as extreme-weather related issues of climate-change, resulting in high dependence on food imports. By contrast, this growth is predicted to be significantly lower in developed countries, particularly across Western Europe. "The Green Revolution of the last century largely increased the world's capacity to feed itself but now we need a sustainability revolution," said José Graziano da Silva, Director General, Director General of the Food and Agriculture Organization (FAO), presenting the report with Angel Gurría, Secretary-General of the Organisation for Economic Co-operation and Development (OECD). "This includes tackling high-input and resource-intensive farming systems that impose a high cost to the environment,” he added, noting the continued degradation of soil, forests, water, air quality and biodiversity. The Agricultural Outlook recommends that regional countries re-orient policies away from cereals that require intensive watering, toward rural development, poverty reduction and farming of higher-value horticulture products. “We need to adopt sustainable and productive food systems that offer healthy and nutritious food, while also preserving the environment and biodiversity," stressed Mr. da Silva. Fresh produce for sale at a street market in Giza, Egypt. Anticipating global improvements in agricultural commodities and food productivity, the report predicts a slide in demand, which will reduce the price of most food staples, over the coming decade. The report attributes the slowdown to stagnating per-capita consumption of staple foods, a drop in emerging economy consumption, and a gradual decline in global population growth rates. Moreover, a decline in the desire to buy meat products will put a brake on the demand for cereals and protein meal used in animal feed. With slower consumption and production growth, agricultural and fish trade are projected to grow at about half the rate of the previous decade.